Small Business Coaching for Positive Cash Flow. I’m a Houston business owner. And I know cash flow is “oxygen” for business. Then why don’t all Houston business owners focus on keeping it positive? It’s possible they’re focused on sales so much it leaves no time to check how much time they have before they run out of money. Or a different reason. I don’t know. But both are necessary. I mean sales and cash. You need both to keep your Houston business moving forward. Remember you always need cash. But you may not need as much sales as you did before, if you manage cash well. Working capital is the cash you need to keep the business running. It includes cash in your bank, which you plan for business. It could include credit cards or business loans. Gross profit is sales minus variable costs. 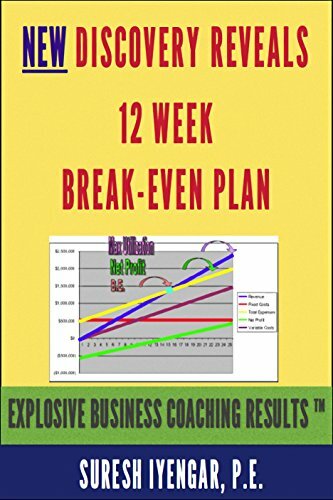 Break-even is the stretch you can go without fully using up your working capital. It’s the ratio of your fixed cost to gross profit percentage. Many business owners don’t check their break-even plan, which could help them keep their cash flow positive. This is also the first step in coaching for someone short of cash flow. Fixed costs are costs you can’t fully remove. That’s why they’re called fixed. You need them to run your business. They include phone, Internet, electric bills, rent and other services. Business owners sometimes don’t watch their full list of fixed costs. Cut fixed cost 10% or more and you’ll break-even sooner. And you’ll need to sell less to get there. I follow this all-important step in coaching. Employee labor, which you can bill your customer for, is the key to your variable cost. Efficient employees will help decrease variable costs. These costs decrease in ratio to sales. So the right steps for efficient work will help your cash position. Set up lean steps to get things done. Quick “go-no go” decisions help in curbing runaway marketing costs. If one marketing track doesn’t yield sales to recover the expense, you’ll need to stop investing in it. Stop before you spend. Stop before it’s late. Check the methods to forecast and see which leads converted to sales. Then repeat the methods, which yield results. 95% of the time increasing prices slightly won’t affect customers. They expect it. It’s treated as normal cost of living. Increasing prices just 10% can withstand fall in sales by 20%. That’s before it affects profits. It’s a powerful way for more cash-flow. Measure the leads from each channel. Measure how many convert to sales. Then increase work, which brings more sales. This will increase profits, which in turn will lower the burden on cash flow. Take these steps and your business will have positive cash flow in just 12 weeks.